A home theater is a combination of equipment to allow you to enjoy the cinema experience in your home. It consists of a combination of equipment to reproduce a movie and its original soundtrack. 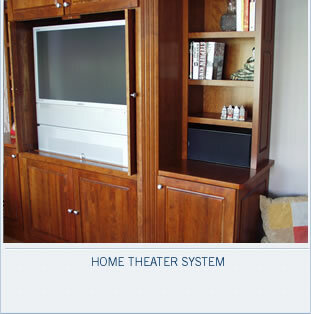 Every home theater installed by EE is custom designed to your specifications. 1. Which room will serve as the theater? Will it be a dedicated room, or will is serve double duty, such as a family room? 2. What is your Budget? Equipment costs can vary wildly, so setting a concrete budget is absolutely necessary. We can design a system to meet any budget, and can often use some of your existing components. However, since we spec. the equipment, and have weeded out overpriced underperformed equipment, then Yes, larger budget equals better product. 2. AVR. Audio/Video Receiver. We offer a number of Harmon Kardon AVR’s. 3. DVD, CD, and VCR players. We offer players from Harmon Kardon and JVC. 4. Cables. Your system is dependant upon a high quality signal reaching each component. All of our systems use a high quality cable from Audioplex as standard or are upgraded to Monster Cable. 5. Cable TV or Satellite box. Provided by customer.